While the US plunges into the Presidential Election, 4-H’ers are plunging into preparations for their fairs. That’s not to say that 4-H members are not involved in their citizenship responsibilities; just check with those who have been to Washington, DC, to experience Citizenship Washington Focus (CWF). 3 Hs came from France? 4-H started in the early 1900s in the US, but as early as 1893 the French Minister of Education was calling for an end to the 3 Rs and a new emphasis on the 3 Hs. July 8, which happens to be the Editor’s birthday, is the date recorded of International Farm Youth Exchange delegates going to Europe for the first time in 1948. 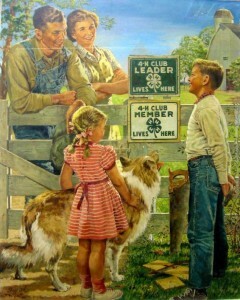 Exhibits are a long-held tradition in 4-H. Use them to highlight and publicize your 4-H History. See how many different types of 4-H publicity you can find in this month’s issue. More importantly, is your club, your fairground, your 4-H history on the Map? CWF is going to give 4-H’ers a close look at the Presidential Inauguration in January. A special edition of CWF to be held during the Inauguration will cap off 4-H summer activities and the presidential campaigns. This summer, 4-H’ers will be actively involved in civic activities as well as preparations for the many fairs. Before you get too involved in either, sit back and enjoy this issue. 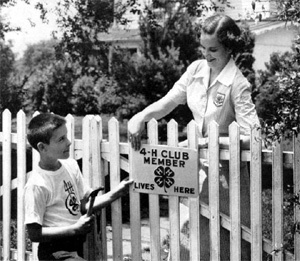 The 4-H Member gate sign has become not only a way to identify where 4-H members live but an important icon of 4-H from the farms to suburbs and urban centers. Whether in a black and white photo or on the full color 1956 National 4-H Calendar produced by Brown and Bigelow Company of St. Paul, Minnesota; the sign speaks volumes more than the words it bears. This entry was posted in 4-H History Preservation Newsletter and tagged CWF, International Exchanges, Sugarloaf by NewsAdmin. Bookmark the permalink.